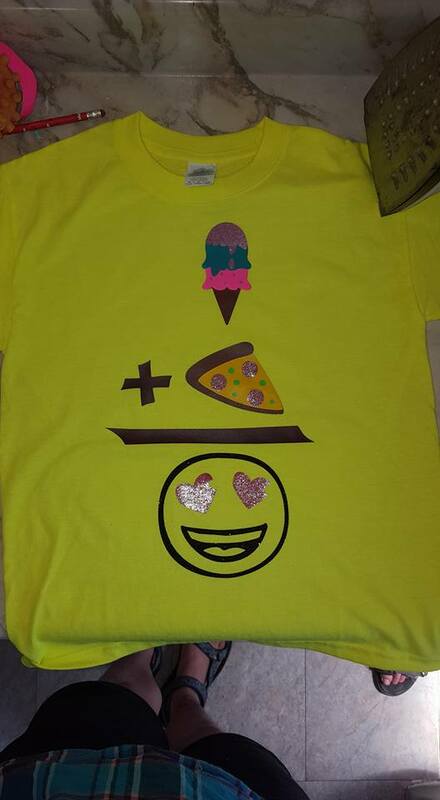 Payette Custom Creations Blog: Pizza & Ice Cream Anyone? As most of you who have followed my blogs over the past 7-8 years know, I have four wonderful children. Each and every one of them love to craft, they are creative in so many ways. I remember as a child I LOVED to draw, and now all of my children draw and they are really good! Super proud mommy right here! My middle daughter, the 10 year old, loves to work with me and my Cricut, no I sadly do not carry the machine in store because the company has never gotten back to me with wholesale information. Insert disappointed face here. I would love to carry Cricut machines instead of just their accessories, cartridges, mats, markers and tools. But that's a story for another time. Today we are talking about my talented little girl who is going to her first slumber party. Her BFF is turning 10 and she is super excited to go and have a fun movie night with her friends. While she's very excited for the party and as creative as she is, she decided she would turn a song that her friend made up into a t-shirt. At this point I am completely gleaming with pride, so excited for her to expand her crafting to making t-shirts. I definitely know when the time comes for someone to take over this family business it will be in good hands with her. The more she wants to learn the more I get to teach her. Again, very happy and proud. "I like my pizza and my ice cream separate, but don't spread them out too much. I like my ice cream and my pizza separate, but I want my ice cream first..."
There is more to the song by my daughter forgets it. Which doesn't really matter, you'll understand the shirt with just that bit of the song. So, she took the keywords from this song that her friend made up and this is the finished t-shirt product. I personally think it is so adorable. She designed it herself and made a fantastic one of a kind gift for her friend. I can't believe how creative she is, and how thoughtful. She's an amazing little girl with a great heart and a fantastic personality to go along with it.